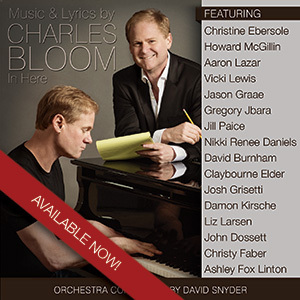 Now available, Music & Lyrics by Charles Bloom: In Here brings together sixteen of musical theater’s finest voices and a full orchestra for 14 of Charles’ best songs. Music & Lyrics by Charles Bloom: In Here includes a 16-page full color book with comments by noted theater critic and columnist Peter Filichia, as well as complete lyrics to all 14 tracks. A brief sampling of each song from the recording.